Shankar Anna(Prakash Raj) is a popular face and serving hand to the needy in his locality.Some incidents with mafia don Nayak(SonuSood)and other rivals(Kota and co)makes him to go into coma for 14 years.Ajay is a undercover cop,where during his undercop operations meets the petite beauty Prashanthi(Samantha)who is a fashion designer.So as usual love blooms between them in a regular telugu movies style.So how Mahesh shows his dookudu and takes revenge on rivals for the incident happened to his father(PrakashRaj) is the rest of the story. 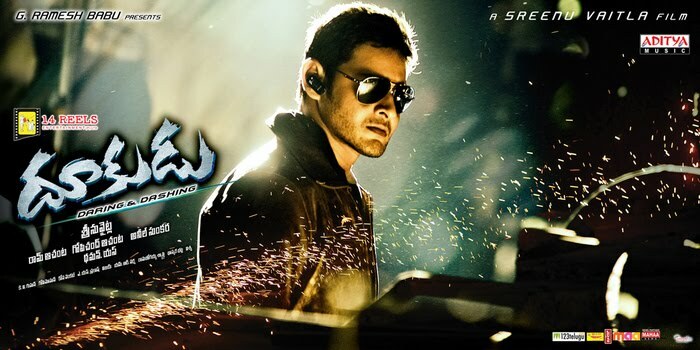 As usual Mahesh's performance is natural and superb,bole tho ek dum jakaas.Samantha's role in this movie is like a comet.Her character doesn't have much importance in this movie.Prakash Raj's acted well but in some scenes its like out of acting exception.SreenuVytla's mark comedians Brahmanandam and MS Narayana has given out standing humorous performance.Sonu bhai as Mafia don played well,but director could have extended his villanish look in a funnyway(like dubai seenu character).Others are okay okay. Music is minus for this movie.Film has total of 6 songs composed by Thaman.In terms of music he is going in Chakri way. (In most of the movies,music will be in similarish way other than 1-2 songs).If you don't believe my fact listen to his earlier movies music like Anjaneyulu,Ragada,Kandireega.This movie can be added to above pool. Mahesh's khaleja dancing steps are best than this movie steps.Choreographic movements are same in most of the songs.Of all DeThadi song is best with some diff steps by backsiders.Then comes the title song and Guruvaram in better positions.Adara adara is shadi type band baaja song similar to okkadu's Attaranitiki song(Costumes and steps of Prince).Puvai puvai song played by tollywood shilpashetty(Parvathi Melton) and Chulbuli comes into good category.All in all,if music could have been better it can be an added advantage to movie's success. SreenuVytla is known for his comedy flicks.Like how actor MuraliMohan in real life believes in land and hence he is the real estate successor,Sreenu Vytla believes in comedy in his movies for success(May be my comparison is bad..but adjust this time....:):) ).Screenplay and direction has regularish vytla mark.Dialogues penned by him are catchy.Other than draggy narration and extra sentiment, credit goes to him for ornate style of direction. The movie is complete out and out family entertainer.Even though it has lengthy narration and over bounded sentiment,comedy overshadowed all the other elements.What ever the rating this movie I give will be applied specific to extraordinary comedy elements and Prince performance.Once you watch the movie and step out of the theature,you may be in copacetic(Satisfactory) way.That's for sure I can say as per my opinion.